After thrashing the West Indies at Mumbai and taking a 2-1 lead, India arrived at Thiruvananthapuram hoping to finish the series in style. West Indies captain Jason Holder won the toss and made the surprising decision to bat first, and things went downhill for his team from there. Virat Kohli pointed out that the dew factor and overcast conditions meant that he would have been happy to bowl first, and he was proven right. West Indies dropped Hemraj Chandrapaul and replaced him with the fast bowler Oshane Thomas, while the injured Ashley Nurse was replaced by the experienced leg-spinner Devendra Bishoo. But Holder’s decision to bat first proved to be a blunder as the Windies top order collapsed badly. Kieran Powell was dismissed in the first over itself as he edged an outswinger from Bhuvneshwar Kumar. Once again all the visitors' hopes relied heavily on the shoulders of Shai Hope, but this time he disappointed by bagging a duck. This was the moment for the experienced Marlon Samuels to step in and play a vital knock. He did start well, playing attractive strokes through the leg side, but Ravindra Jadeja completely deceived him with a well-bowled slower delivery. Jadeja then struck again as he got the dangerous Shimron Hetmyer out with a good length delivery that turned a touch to rap the batsman's pads. Jason Holder fought a lone battle for some time before being dismissed by Khaleel Ahmed. Eventually, the Windies were bundled out for 104. Chasing a modest target, India would have hoped for Shikhar Dhawan to get set and score a half-century, but he disappointed yet again and fell to Thomas in the second over itself. Rohit Sharma and Virat Kohli then combined yet again for a big partnership. Rohit entertained the crowd with some stylish sixes and India easily chased the target with 9 wickets remaining. 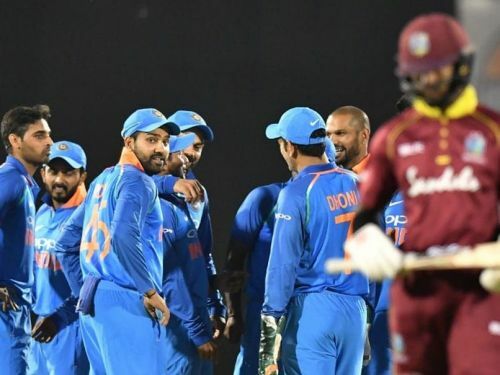 There was a lot of praise for the Windies batsmen from their captain Jason Holder after the first three ODIs, as they comfortably scored above 250 and gave their bowlers decent totals to defend. But in all three ODIs, they heavily relied on two promising youngsters, Shimron Hetmyer and Shai Hope. That over-dependence on a couple of players has eventually cost them the series, as the dismissal of Hope in the 4th and 5th ODIs resulted in staggering collapses. Their openers have been disappointing to say the least, as they never gave the Windies middle order a decent platform to build from. Rovman Powell was promoted to open the innings but he struggled badly and departed for a meager 16 runs for which he took 39 balls. Samuels got a start but ended a nightmare series with a soft dismissal. Hetmyer fell cheaply this time after impressing everyone with his power hitting at the start of the series. No one really showed the grit and composure to play a lengthy innings, and that resulted in the downfall of the team.